BELIZE CITY, Wed. July 29, 2015–The Statistical Institute of Belize (SIB) today released the latest economic data reporting on mid-year trade and consumer prices. According to the SIB, merchandise imports for the first half of 2015 grew by 5% or $46 million, for a total of almost $1 billion, while the country’s exports for the same period fell by roughly 11% or $37 million, down from $341 million exported during the first half of 2014 to $304 million exported for the first half of this year. “Crude petroleum contributed greatly to that decline, with earnings dropping sharply by almost $33 million from $51 million to $18 million during the period,” the SIB said. 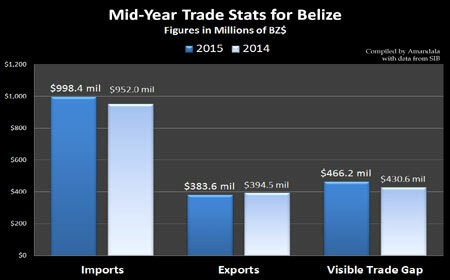 For the month of June 2015 alone, Belize imported goods valued at $189.2 million, up by $31.7 million or 20.1%, from the $157.5 million imported in June of 2014. According to the SIB, the largest increase was in the category of ‘machinery and transport equipment,’ up by almost $16 million, from $31 million to $47 million, due to purchases of sailboats and airplanes during the month. Meanwhile, the value of imports categorized as ‘manufactured goods’ grew by more than $6 million, to almost $24 million due to the importation of more construction supplies. On the other hand, a decrease in the quantity of fuel imported as well as lower fuel prices on the world market caused a decline in the value of imports of ‘mineral fuels and lubricants’ from $17 million last June to $14 million this June. There was a fall in the value of Belize’s domestic exports for June 2015 from $66.6 million last year to $52.6 million this year—representing a decline of $14 million or 21%. “This decline was due primarily to decreased exports of some of the country’s top export earners, including orange concentrate and shrimp,” the SIB said. Belize exported $12 million worth of merchandise to United States of America, as $21 million worth of Belize’s sugar sales were to that country, said the SIB, with exports to the United Kingdom, another of Belize’s top trading partners, having diminished by over $14 million, due primarily to a drop in sugar sales to that market. Meanwhile, consumer prices were 0.8 percent lower in June 2015 than in the month of June 2014, and the first six months of this year saw an inflation rate of -0.9%. Food prices fell only marginally by an average of about 0.1% when compared to the same period of last year, but the fall in fuel prices was substantial. “Falling fuel prices continue to be the major contributing factor to the overall decline in consumer prices,” the SIB said, pointing to declines ranging from 18% to 25% on the price of fuel and airfares. Again, Dangriga was the only municipality to record an increase in consumer prices, with an inflation rate of 1.9 percent for the month. 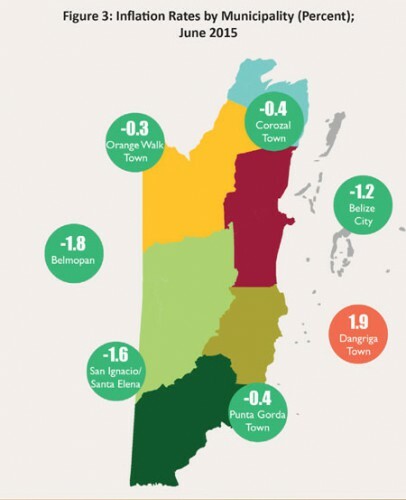 Belmopan, meanwhile, recorded the greatest decrease on average, at -1.8%.